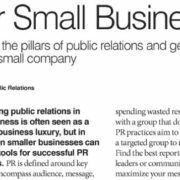 Brian Murnahan, FWPRSA’s treasurer & president of Murnahan Public Relations, wrote an article about the essentials of PR for small business in the July issue of FW Inc.! We’re proud to call you a member, Brian! The myriad communication channels we now manage can make it difficult to create streamlined content that generates mission-driven results. Join us Wednesday, August 9, from 11:30 a.m. – 1 p.m., as we welcome award-winning public relations team members from Cook Children’s Health Care System to learn sound strategy in developing content, which will help generate results for your organization. Cook Children’s, the 2016 Best of Show Worthy Award recipient and one of the nation’s best children’s hospitals, will present how they successfully create in-depth, multi-year communication programs on a limited budget, while also dealing with multiple departments. Hear how they break through departmental silos to create interwoven system-wide initiatives and use a variety of communication tactics to tell their stories. The implementation of streamlined content, developed in tandem with their community outreach, marketing and website teams, allows the organization to be nimble as they respond to campaign metrics. This flexibility converts to true mission-driven results.